In addition to its own extensive line of ultra-compact marine and industrial diesel gen-sets, Next Generation Power serves as one of the original Phasor Marine master distributors for the Southeastern US. Next Gen offers Phasor Marine 5-99 kW models that meet EPA Tier 3 and Tier 4 regulations, including newly-introduced ignition protection certified units. 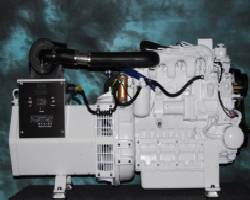 Phasor Marine models employ fuel-efficient Kubota and John Deere diesel engines, world-known for their quality and dependability. The freshwater, heat-exchanger cooled marine generators feature a cost-saving, low 1,800 rpm operating speed for less noise, vibration and wear. Easily tailored for many applications, standard features include safety shutdown systems, solid-state voltage regulation and four-point isolation mounts. Options range from custom remote instrumentation to sound attenuation enclosures and chrome packages. Retail prices for standard Phasor Marine units start at $5,995. For more than 10 years, Next Gen has engineered safe, reliable and durable power solutions to the marine, RV and industrial markets. It offers a wide range of diesel gen-sets, power units, compressors and custom combinations, including its own ignition-protected models.